A few weeks ago when I was wandering around New York City, I came up Flying Tiger, a Danish design store that sells all sort of interesting and inexpensively-priced home goods. While I’m trying to have more of a minimalist approach to shopping lately (except with clothing and accessories), I couldn’t resist purchasing this bobbin case. Though I’m not much of a seamstress, I own a sewing machine and perform small jobs like hemming simple pieces and repairing seams. One of the things that drives me crazy is that I only have a few bobbins, so I usually have to spool one every time I sew. This case holds 25 bobbins, so it’ll be nice to have them filled with colors I often use like black, navy, gray, red and white. What a great time saver! This case also appeals to me because of my love of organizing and my desire to make things neat and tidy. 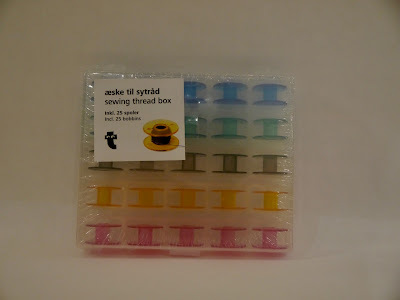 It’s a wonderful addition to my sewing kit!